Our product range includes a wide range of air slide belts. Our Air Slide Belts offer accurate airflow and durability for a wide range of Industrial applications - both industrial and technical. Industries serviced are : Cement, Aluminum, Sand, Gravel, Flour, Fly ash and much more. 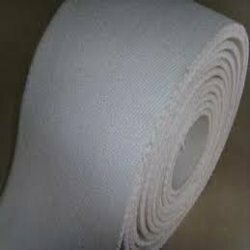 There are also other types of Airslide Permeable Belts, available with us, as per your requirements. Kindly fill the Enquiry form, in the Contact Us page, if further information or recommendation required. Both Cotton (Spun & Filament) Belts & its combinations, are available, and Widths available up to 66' wide (Widths of 115' available from 2015) and Thickness up to 14mm, is currently available. Looking for Air Slide Belts ?